If you are a commercial cattleman, you simply can't afford NOT to be crossbreeding. 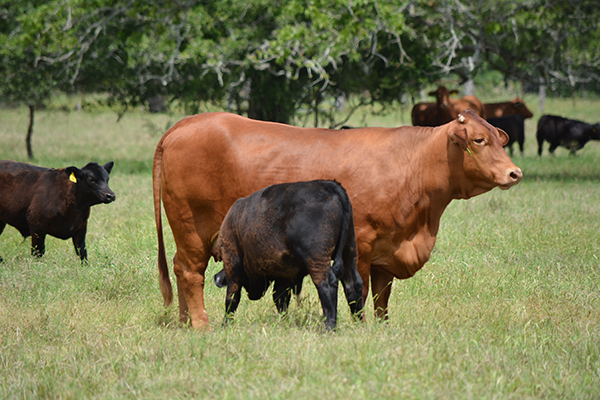 The benefits of a crossbred cow to any commercial herd are undeniable and highly documented. Crossbreeding leads to Hybrid Vigor or Heterosis. Simply put, crossbred calves (on the average) are better performers than their straight bred parents. More vigorous at birth, faster growing calves perform better for almost every trait and make more money (this is Individual Heterosis). But it gets even better. Crossbred cows improve calving rates, calf survivability, more calves born and weaned, more pounds of calf and more calves produced over the cow's lifetime (this is Maternal Heterosis). With good management, Maternal Heterosis will make a rancher more money than anything else he can do. Beefmasters are the most important part to any crossbreeding program because of the powerful impact they have on Maternal Heterosis. If your cowherd is predominantly Angus or Brangus, using Beefmaster bulls on those cows will create superior crossbred females to capitalize on Maternal Heterosis. The driving factor for hybrid vigor in crossbreeding is Retained Heterosis. Because of the unique genetic content of Beefmasters, 63% of the possible heterosis is Retained. This is significant because most American Breeds retain 47% heterosis. Beefmaster bulls will pass along that 16% increase in heterosis in the form of more pounds of calf weaned and more productive females in almost every trait. That equates to more dollars from every cow sired by Beefmaster bulls. The ultimate in crossbreeding programs come from mating the crossbred cows to bulls of a third breed. In terminal crossbreeding programs like this the Beefmaster crossbred cow truly shines. An ideal crossbreeding scenario that maximizes all possibilities would be an Angus x Beefmaster cow mated to a Continental breed bull. This genetic combination allows the cow to retain enough Brahman influence to be superior in maternal traits, adapted to most environments and yet show little enough ear to be readily acceptable in today's marketplace. Progeny sired by bulls of another breed, especially Continental breeds would show very little if any 'ear' and would have all the benefits of stacked Hybrid Vigor, especially maximized pay weights'after all, we still sell cattle by the pound! By the way, should a rancher decide to keep heifers sired by Continental bulls, the fastest way to instill maternal worth in those females, is to breed them back to Beefmaster bulls. No one can add as much to the maternal suite of traits in as short a generation interval as Beefmaster bulls. Here again, this is because of the 63% Retained Heterosis in Beefmasters and the unique genetic makeup they possess. This program was developed to help cattlemen find and sell good Beefmaster and Beefmaster influenced cattle and to do whatever possible to positively influence the demand for them. It serves both BBU members and commercial cattlemen who use Beefmasters. It builds on the proven performance of Beefmaster cattle, the success of BBU's breed improvement, educational and research programs, then takes it one step further: to hands-on marketing support. It helps you find the Beefmaster cattle you want and realize the most value for the good Beefmaster and Beefmaster-influenced cattle you want to sell. We work directly with buyers and sellers and through pertinent marketing and educational channels to help you realize the full value of your good Beefmaster cattle. Assist BBU members and commercial breeders in merchandising their feeder cattle. This may include direct ranch trades to feeders and stockers; conducting commingled feeder calf sales for the benefit of smaller producers; providing larger producers the opportunity to participate in special Beefmaster sections on video sales; and offering an alternative pricing mechanism by which cattlemen can discover the true value of the cattle they produce. In short, we'll do whatever we can to add more value to your feeder calves. 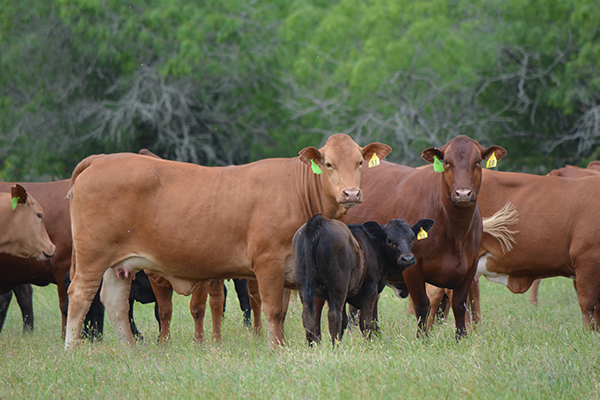 Encourage cattlemen to vaccinate and wean calves before they leave the ranch. Provide information feedback from the feeder and packer as to the feedlot and carcass performance of your cattle. Act as a liaison between calf producers, feeders and packers. Promote the true value of Beefmasters to different segments of the industry. 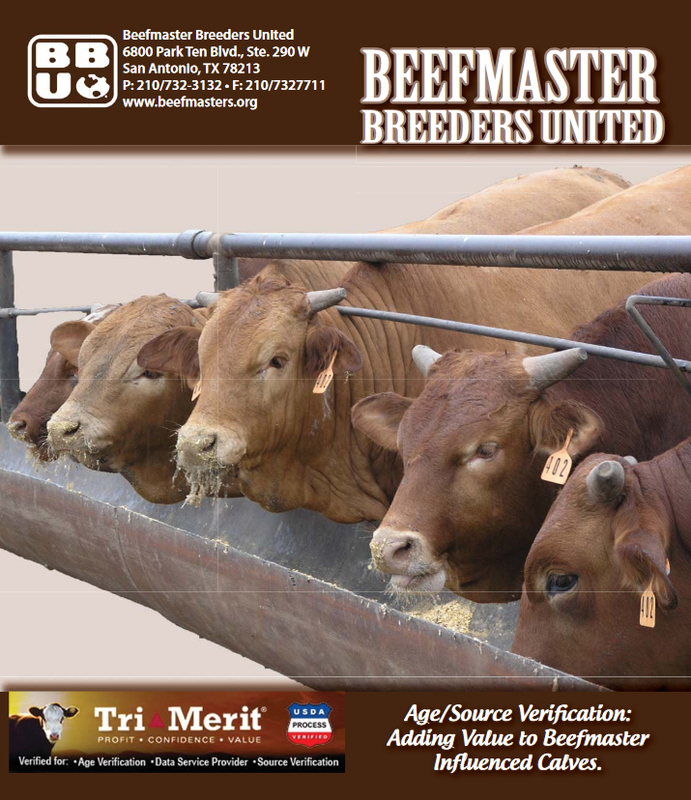 Dispel myths associated with Beefmaster cattle with unbiased research. Assist cattle feeders in locating Beefmaster and Beefmaster-influenced cattle. Give seedstock producers the opportunity to use the BBU Field Service Representative as a customer service tool for their bull buyers. Encourage the purchase of E6 heifers to replace culled cow herds. Encourage commercial producers to add value to their herds by enrolling young cattle in the E6 Program with the goal of eventually having an entire herd of E6 females. Encourage commercial producers to insist that the Beefmaster bulls they use be registered and transferred to them.